Sony Ericsson K800i Cyber-shot is the official name of the new camera phone from Sony Ericsson. The model was announced in March 2006 and should now be available in most markets. The K800 is a 3G (UMTS) video phone and has an impressive 3.15 mega pixel camera being the first model to wear the Cyber-shot name which originally was used on the high class digital cameras from Sony. Due to some of the feedback received for the original review I think it is in place to clear up a couple of misunderstandings. This review will focus on what is new or what has been improved compared to the Sony Ericsson K750. For example: I will not list or describe that it is possible to view the calendar in both month and week view and describe this in detail as this functionality also exists in the K750. The review is subjective and focus on the things I find important. If you want to have list of all possible features, just visit the Sony Ericsson web site and learn more about the K800 there. My K800 package did not include any M2 (Memory Stick Micro) card and I was a bit disappointed when I found this out. K800 has only 64MB internal memory. A photo captured with image quality "Fine" at maximum resolution occupies around 800KB. Subtract a couple of megabytes occupied by messages, themes, MP3 files, games and other apps and that not leave much room for your photos. The missing memory card does keep the price tag down, but in return you will probably feel that this phone needs a memory upgrade the moment you buy it. Reminds me of a digital pocket camera I bought a couple of years ago. A 16 MB SD card was included and it could hold 3-three photos! Why bother? Considering the few type of devices using M2 cards, I think the price for these memory cards is relatively cheap with around EURO 50 for 1 GB in the summer 2006. The included hands-free is ordinary with the usual proprietary Sony Ericsson plug. You can not use your favourite headset with this headset plug. The size of the phone is a little larger than the K750 and W800 Walkman models, but it is still a handy format. The display quality is one of the best I have seen and it is crystal clear even in bright daylight with the sun high on the sky. The display resolution has a pixel resolution of 240 x 320 which is the relationship of 4:3, the same as older televisions. This is also the same relationship as the photo files have, meaning that what you see in the viewfinder is what you get. I find it naturally to compare the K800 with the well known Sony Ericsson K750 which also was promoted as a camera phone. I would characterize the K750 to K800 update an evolution, and not a revolutionary new model. The K800 display is a little larger than the one found on the K750. I have calculated the increased number of pixels and compared it with the display width and height. The result is a 26% increased display size and a 98% increase in number of pixels giving a much better resolution and viewing experience. The last time I was this impressed by the sharpness of a phone display, was when I got my hand on a Sony Ericsson S700. The S700 display was very sharp and clear, and also felt unbreakable. But after just two weeks usage, I have already managed to create a small scratch on the K800 display. It was my own fault of course. I should know by now that house keys and phones should be kept in separate pockets. K800 is an UMTS video phone and the tiny video camera is located above the display integrated into the loudspeaker. It is not protected by any lens cover, but the speaker and lens is immersed a little bit so you won�t be able to touch the glass by accident. Two extra buttons are also located above the display and are used by the camera application and picture viewer. The battery charger has a new form and is named CST-75. It is the type where you can charge the phone and at the same time plug-in the headset. The battery is also new. It is called BST-33 and is a 3.6V 950mAh battery. Oddly enough: M600i also use the BST-33 battery, but this (maybe older) model is a 900mAh battery. I have not scientifically measured the battery capacity, but I the phone have been tested for weeks, and I do not think it is any worse or better than the other Sony Ericsson models. It last for 4-5 days with normal (not much video call) usage. During the three weeks test period, the phone has been connected to a 3G net. play/stop button for the latest used sound application. The button will start or stop the radio or music player depending on which application you used last. Two sound level keys. Also used by the camera application to zoom. Two camera keys. Located above the display on each side of the top speaker. Some java games make also use of these two keys. Located on each side of the joystick, there are the back and cancel keys, two soft/selection keys where action depends on currently active menu, an Internet key and finally the Activity menu key. The Activity menu is four lists of New Events, Running applications, Shortcuts (customizable list of often used menu elements) and a list of URL to the last visited internet pages. Power button. When the phone is powered on, and the power button is pressed shortly, a few options appear. Power off, Turn on silent, Key lock and a list of phone profiles. The number keys seems to be of rubber and they are pleasant to use but the click nose might be irritating is silent environments. The rest of the keys plus the joystick are of plastic. Sony Ericsson has wrapped the K800i in with a scratch resistant material. It is not the "metal look-a-like" material we have seen so often before. The few parts where you probably will see the first scratches are on the display glass and the lens protection sliding cover. On the bottom of the K800 there is a strap for fastening a lanyard. The K800 does not have any kind of protection covering the combined contact for power outlet and headset. 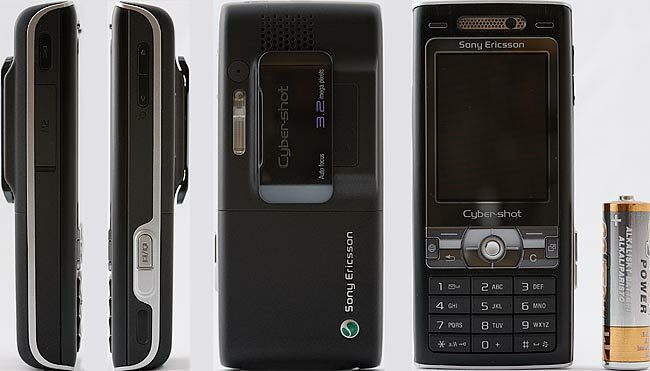 Some of the other Sony Ericsson phone models have a plastic thing meant to protect the contact from dust. I like this non-protective version better. The K800 may not have the fastest processor installed, but the operating system seems to work fine since I never have been forced to wait for a task to finish. Sony Ericsson W900 scores much better on Java benchmarks where heavy graphics are involved. That is probably because the W900 has a 3D hardware accelerator while the K800 does not. The menu system is basically inherited from the older Sony Ericsson phone models. If you are coming from older Sony Ericsson models, the K800 menu. The main menu is organized in logical 9 main icons representing PlayNow, Internet, Entertainment, Cyber-shot, Messaging, Music player, File manager, Contacts, Video call, Calls, Organizer and Settings. PlayNow is a direct web link to premium ringtones, music and games provided Sony Ericsson. It seems like Sony Ericsson not only want to produce handsets but also want to have a share of the lucrative mobile content market. The Entertainment section hides the Radio, Games, Video player, VideoDJ, PhotoDJ, MusicDJ, Remote control and Record sound applications. The three pre-installed Java games are simple and playable, but does not impress much graphically. Sony Ericsson sponsors the WTA tour and it is the same Tennis Multiplayer game we saw shipped with K750. It has nice graphics, but we have seen this before. Photo Quest is a game for the youngest children where you play a scuba diver and the goal is to capture most photos of fishes in the sea. Mini Golf is a very playable game if you like these kinds of games. It is nice, but I think it lacks some on the graphic side. That is probably because I have tried the golf Java game from Gameloft on a M600. The Radio is a stereo FM radio with Radio Data System (RDS) that includes features such as presenting the station name and automatically changing frequency to keep the active station. The K800 organize it's files in 9 different folders such as Camera album, Music, Pictures, Videos, Themes, Web pages, Games, Applications and Other. The Other folder is where it place received files with an unknown file extension. It is possible to browse only the phone memory or the Memory Stick Micro memory. You will eventually run out of memory, and it is nice to see that it is possible to see the size used in every folder. It makes it easier to clean up. Sony Ericsson K800i has a good application for organizing music and playlists. As far as I can see, the player is the same you find in the Walkman range of phones. It is missing the Walkman logo and colours, but it is just as easy to organize MP3 and MP4 music files. Music files are organized by artists or tracks. The PC application Disk2Phone is the provided and preferred way to transfer convert and transfer music to the phone. The play button on the side of the phone will start or stop songs playing. The button controls the last used applications of the two: Radio or Media player. 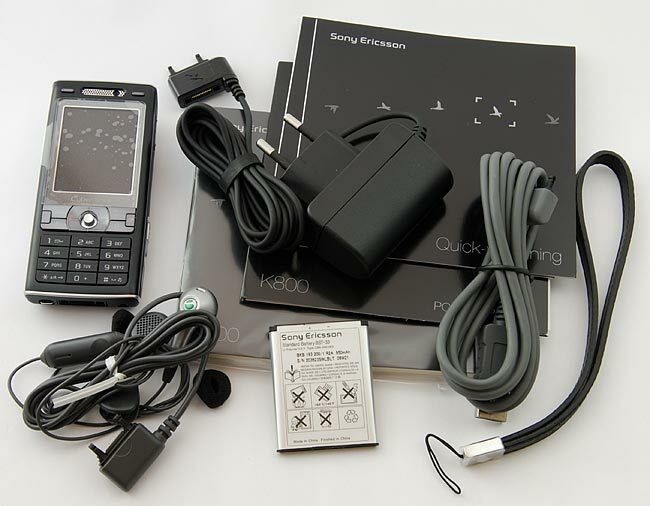 Sony Ericsson K800 can communicate with other devices via infrared, Bluetooth and the included USB cable. 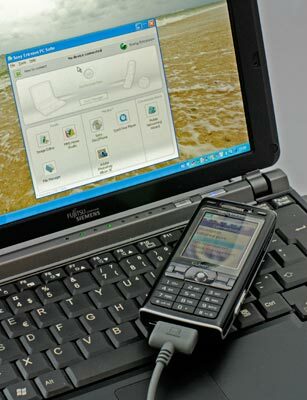 When you connect the phone to a PC via the USB cable, it is possible to access the files stored on the phone memory using Windows Explorer. The phone will be visible as a removable drive in the Windows operating system. The other option is to connect to a PC using the included Sony Ericsson Phone Monitor (PM) application. The PM connection method is needed if you want to synchronize with MS Outlook or Lotus Notes. If you have bought some extra memory and want to use the K800 as a MP3 player, you will find that the fastest way to transfer the MP3 files to the phone is to use the USB cable and the included Disc2Phone. Disc2Phone will convert your CD's to MP3. Another, and probably the fastest way to transfer files is to buy a card reader and just copy the MP3 files directly to the extra Memory Stick Micro card. Most part of this review is written away from the office, and the Sony Ericsson K800i is my only connection to the net. I am checking email and keeping track of Esato in general with a laptop connected to a K800 via Bluetooth. It works like a dream. Sony Ericsson Phone Monitor application and m-router was not easy to install. The Phone Monitor installation application refused to install on my work machine with Windows XP x64. I also had problem when trying to use the PM with a laptop and Bluetooth. Dial-up was not any problem, but the PM and m-router could not find the K800. I am waiting for the excellent freeware application MyPhoneExplorer to be updated with K800 support. It does everything I need, and I have never had any problem finding the phones using this app. It is also a very convenient way to make a complete backup of a mobile phone. If you want to install the Phone Monitor, you should NOT use the version shipped with the K800, but instead do what I did and download a newer version from the Sony Ericsson website. Just as the latest range of Bluetooth enabled Sony Ericsson phones, the K800 can also be used as a remote control for your PC. Three pre-installed profiles are available: Desktop, MediaPlayer and Presenter. Starting the Remote Control application MediaPlayer let you use the K800 as a remote control for the Windows Media Player PC application. The phone keys can start, stop, pause, play next, play previous songs and more. Starting the Remote control application Desktop let you control the mouse with the phone joystick. New Human Interface Device (HID) profiles can be created on a PC and then transferred to the phone. Such HID-profiles turns the phone into a custom made remote control for almost any PC application. The Internet application does not only support WAP, but also XHTML and HTML pages. I.e it is possible to browse both ordinary web pages and pages created especially for mobile phones. These pages will be shrunk down to fit the K800 display width of 176 pixels. My three most favourable features is the option to view pages in landscape mode, the option to browse in fullscreen and the feature I find most pleasant: Internet keypad shortcuts. When using the shortcuts, you can press a key to access the most used internet functions such as switching to fullscreen, landscape, zoom and access bookmarks with a click on a number key. Sony Ericsson promotes the K800 has a 3.2 mega pixel camera. If you multiply the width and height of the high resolution images, you will find that the sum is 3.145.728 (2048 x 1536). That is 3.15 mega pixels which is closer to 3.1 MP than 3.2. To me, it seems like the mega pixel race is more important than image quality. I can see the reason why they do this. It must be because it is difficult to set some kind of ranking number for image quality and use that in marketing. Some might say that mobile phones soon will replace digital cameras. My prediction is that it won�t happen within the next 5 years. Camera phones will of course be more sophisticated, but so will the dedicated digital cameras. I think that Canon, Nikon, Sony, Panasonic and Olympus have the necessary power and expertise to fight back against the phone manufactures. On the other hand, now that Samsung and Sony have entered the digital SLR camera arena, we might see some synergy between their phone- and camera divisions. The Sony Ericsson K800 camera hardware and software has probably also been developed with the help from Sony�s camera division. It has some of the camera features also found in Sony Cyber-shot cameras, and the image sensor is most likely developed by Sony. Well, enough of my thoughts and back to the K800 camera review. 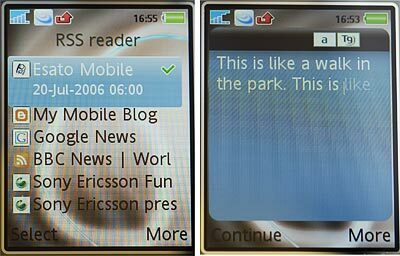 The phone display works as a viewfinder and the menus are orientated horizontal when the phone is turned 90 degrees to the left. The live view picture covers the entire display with some essential camera information on top of this. I found some very annoying display lag when shooting with the Twilight scenes set in a dark environment. Sony Ericsson K800i Cyber-shot does not have a night mode setting as the one in K750, but the twilight scenes is pretty much the same. You can save photos in four different resolutions 3MP (2048 x 1536 pixels), 2MP (1632 x 1224 pixels) 1MP (1280 x 960 pixels) and VGA (640 x 480 pixels). When the image stabilizer kicks in, 3MP image has a 2000 x 1500 pixels resolution. The thing Sony Ericsson was eager to highlight back in March, when the K800 was announced, was the BestPic feature. The result of a BestPic shot. The car in the middle was captured when I pressed the shutter button. With BestPic enabled, 9 pictures are captured in a row. Four of them are taken when you press the camera trigger button half way down, one picture is captured when the button is pressed all the way, and the final four is captured just after the key press. A row of nine thumbnail images of the captured photos is displayed, and the intention is that you now can save the one picture where nobody is blinking with their eyes. The Xenon flash does not work during a BestPic series so good light is a necessity. I think the BestPic is a clever new addition. I have from earlier experience found that images tend to be captured when the phone is on it's way from the aiming position down to the pocked, and the BestPic mode prevent this from happen. A few manual adjustment settings that you expect to find in digital cameras is not available on the K800, but it is possible to do some post processing to the saved photo files. The editing is done in the PhotoDJ application and they are: Auto-levels, Light balance, Brightness & Contrast, Red-eye removal, Effects. The included user-manual could have been called quick start guide. It lacks a good coverage of the available camera functions. There are two choices for those how want to learn more. One is the downloadable 23 page long Camera - capturing, saving and editing manual (sonyericsson.com/support). The other, but shallower choice, is to run the pre-installed Java tutorial application called Photo Mate. It explains how to compose and frame better pictures of people, capturing night pictures, making scene selections, how and when to use the image stabilizer and more. Built-in Xenon flash. This is not a small led light, but a real blinking 3 meter reach flash. One of the flash settings is red-eye reduction that works as expected. Keypad shortcuts. I like this time saver. Many of the most used camera menu settings can be changed by pressing one of the phone keys. For example: To enable the image stabilization, you have to activate either the Landscape, Twilight Landscape, Beach/Snow or Document scene selections. You do this by pressing the right photo key and browse through all 8 available scene selections. Auto-focus which actually works and help you capture pin sharp photos. A red led light is automatically turned on in dark environments to help the camera auto-focus. 16 x digital zoom. I do not really see the point in having this because all basic PC image editing software can do the same thing much better. Lens protection. A stylish sliding lens cover protects the lens from getting fingerprints. The cover lacks some kind of lock and unintentional opens from time to time. Video quality. The K800 can record video in 176 x 144 as a maximum resolution which does not impress me much. When the K800 was announced, I was told by Sony Ericsson officials that the video camera would have a QVGA resolution (320 x 240 pixels) but they have obviously abandoned this. No more torch- and video light. You can't use the K800 as a torch as you could with the K750. 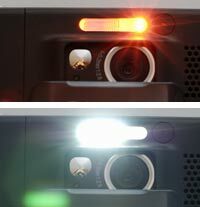 The Xenon flash will only flash when you capture a photo and not when recording a video clip. Pictures can be printed directly from the phone if connected to a PictBridge enabled printer with the included USB cable. 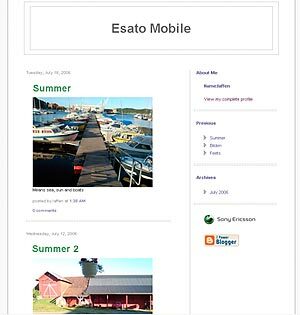 Download and read 7 user manuals from the Sony Ericsson website. These Getting started documents cover the following: Email, Internet, Synchronization, Video calls, Music player, File manager (with and without a PC connection) and the Camera. All this is recommended reading. All in all, the K800 is an excellent point and shoot camera capable of producing very sharp 13x10 cm prints. The colours produced (with firmware version R1CB001) are natural saturated but maybe a little cold (blueish). This is a white balance issue and can be adjusted by the user by changing the white balance manually. K800 tends to sharpen low light photos too much for my taste but daylight images are excellent. Sharpening should be the last editing done to an image. Colour corrections, changing the size and other adjustments should be done first. The noise on low light pictures is very evident. My guess is that we can expect more user control in upcoming devices and that sharpening is one of the image processing steps it will be possible to reduce. One of these settings could be to set the compression level. I have a tip to Sony Ericsson which is something that has been discussed a lot in the Esato forum. The advice is to let the user have the option to set JPEG file compression level them self. The two keys on top of the display are handy shortcuts to the K800 photo folder. Pressing the right hand key list the latest captured pictures in a 3x3 thumbnail table and scrolling to older pictures is done with the navigation key. The left key opens the last capture picture in fullscreen. This is a rather handy function I use often. Sony Ericsson K800i support SMS, MMS and Email messaging types. Received MMS and SMS messages are located in the same inbox and are ordered by arrival time, not message type. Sending MMS-messages are limited to the maximum 300 kb by the phone, but your operator may have a smaller transfer limit per message. The Email application is quick even with a large number of emails. In one of my email accounts, I have currently 461 messages in the inbox and 300 of them are unread. It is a Gmail account and the email is downloaded to the phone with SSL encrypted POP3 access. Browsing the list of these downloaded email headers is fast, and the number of messages does not seem to slow down the browsing. One of the options is to download only the subjects of new email messages. The other option is to specify a size limit for the messages to download. Messages over the set limit are only partially downloaded. The full message can be downloaded later. Switching between email accounts can easily be done by selecting from a list of available accounts. Downloaded emails will not be deleted when you switch between the accounts. K800i has a new and improved spelling functionality. You all probably know how T9 predictive text works so I am not going to explain that part. The new cool feature is something called Next Word Prediction (NWP). When writing a message or note, and the T9 spell check and the T9 Text Input is activated, the NWP will predict next word previously used in a sentence. It can be very useful, but requires some practice before you get used to actually look at text while you write. K800 are able to subscribe to Really Simple Syndication (RSS) feeds, and the RSS is for some unknown reason placed in the Messaging main menu. RSS is a kind of subscription service for news, forums and blog services. Esato has two, one for mobile phones at http://mobile.esato.com/rss/ and another for web browsers at http://www.esato.com/rss/ Typical RSS usage is to set up the reader to fetch the latest news at scheduled intervals and then read the news on the subway on the way to work. Adding new RSS feeds to the K800 is easily done by entering the address manually or when you are browsing the internet with the phone. Updates can be set from every hour to once a week. When the phone has downloaded the latest RSS headlines and if any of these are new, a small icon will be shown in the topmost status line. The K800 is promoted as a Cyber-shot phone. A name only dedicated to the best digital cameras from Sony. I enjoy taking photos with my phone, and when using a K800, the results are acceptable. It is probably one of the best camera phones out now. To bad it is sold without enough memory. When calculating the cost, remember to add EURO 50 or so for a 1GB memory card. The operating system is thoroughly tested since probably only the camera application is new. The phone has never stopped responding during the test period and I can not say that about all phones I have used lately. Communication via wire or wireless just works. I can see that part of the Sony Ericsson communication suite is the same as the one shipped with the last Ericsson (that is Ericsson, and not Sony Ericsson) phones. I had trouble installing and set up the application suite on two PC. So it is room for improvement with the included communication application. The Internet app is as good as it can be. It supports full screen and landscape mode. It has adopted the Smart-Fit thing from the Opera browser, and it works even with badly written web pages. The exterior is good looking and I think the case (except the lens cover) material should be able to bear a bump or two. And finally: The K800 update service makes future firmware update much more convenient to do. This review was based on a K800i with firmware version R1C001.